Finally, an iPad app for Microsoft PowerPoint! Hallelujah, our calls have been answered and Office has truly gone portable. So portable, we should all just throw our laptops out the window! Yes, the new Office for iPad is awesome (and long overdue!). But before you jump the gun and decide to make this your new GO-TO TOOL of AWESOMENESS, let’s take a step back and make sure we fully understand exactly what PowerPoint for iPad allows us to do. You’ve probably already heard that PowerPoint for iPad is a COMPANION for your desktop version of PowerPoint, meaning it’s not a REPLACEMENT for it. Does the iPad app help us be productive? We’re going to ask ourselves this very basic question: does the PowerPoint app for the iPad help us be productive? As a companion to ‘regular’ PowerPoint, the best way to stay productive is to know exactly when to use PowerPoint for iPad and when to wait until you’re back at your desk. Think of it this way, if you’re on a 1-hour flight and you fire up PowerPoint for iPad, what is actually worth your time to do? There are some things you won’t be able to do at all (Fuhgedabout It), others we caution you about doing (At Your Own Risk), and then some things that are seamless and wonderful to do (Four Awesome Things). First off, there are tasks that are simply not supported in PowerPoint for iPad…so don’t even think about it! 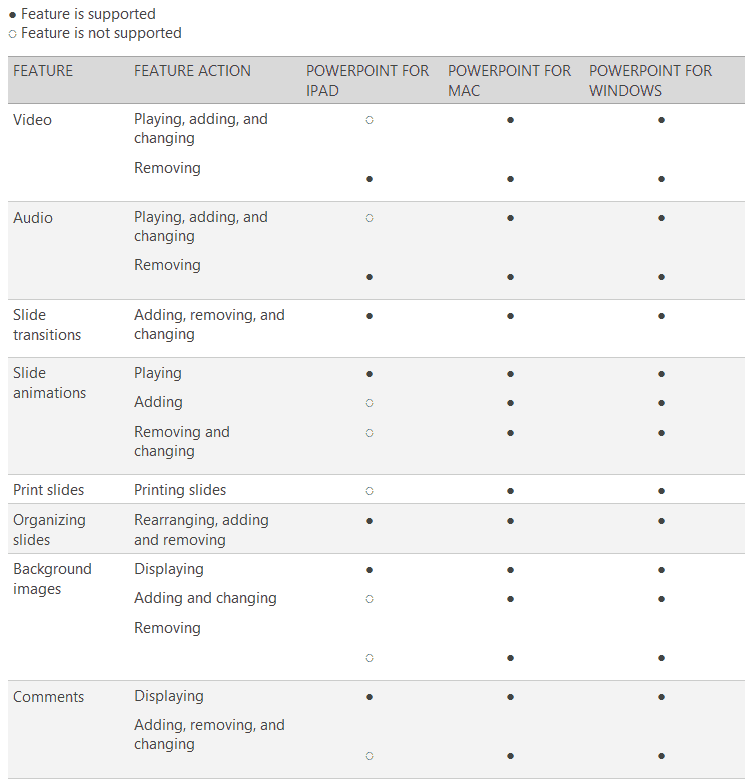 Review the below list posted by Microsoft to see what’s supported and what’s not. Microsoft may yet add these features later on, particularly since we hear a lot of people complaining about the PDF saving and printing. Now there are also a few subtler areas you need to pay attention to, particularly if the slides you tend to build are content-heavy ones. *Warning! some of these may really tick you off. We understand PowerPoint for iPad won’t be able to do all the things its desktop version does; we simply want to warn those power users out there about relying solely on this mobile version to build content-heavy slides from scratch. Easy aligning and positioning of your objects. Without the Alignment Tool, it’s significantly harder to get objects into perfect relative alignment and positioning so that your slide looks sharp. The latest version of PowerPoint for iPad does now include Smart Guides, which is massively helpful and makes aligning things much easier. Maintaining the size consistency of your objects. Yes, you can manually resize objects and/or copy and paste objects that are already on your slide, but without real resizing input boxes, it is impossible to build a consistent, professional layout. Just try and draw a straight line in PowerPoint for iPad…it LOOKS straight, but mine always end up with a height of 0.02 on my desktop version! Maintaining formatting consistency of your objects. We tip our hats to Microsoft for including the ability to copy the formatting of one object and paste it on another (the equivalent of CTRL + SHIFT + C / CTRL + SHIFT + V), but the inability to specify shape outlines for objects is a major drag. The best workaround we’ve found is that if you default your formatting on your desktop, the defaults (including the outline weight) will carry over into PowerPoint for iPad. Need to get away from those default outlines though, and you are out of luck. Breaking up BLoBs (Boring Lists of Bullets). Without SmartArt, we’ve lost our favorite easy way to break apart people’s boring lists of bullets. Cropping pictures. Without the cropping tools, you are more or less stuck with your pictures as is. Building / editing company templates. Without the Slide, Notes and Handout Master Views, you are unable to build, edit or update your company’s standard templates. So again, if you’re thinking of building content heavy slides from scratch in PowerPoint for iPad, you’re setting yourself up for a headache! Now despite all the failings listed above, we don’t want you to get the wrong idea; we are still SUPER excited to have this wonderful new app to take our presentations on the go. PowerPoint for iPad is very user-friendly and using it you have zero worries whatsoever about compatibility, which is a huge relief for many of us. Reviewing / updating notes. This is perfect for tweaking and reviewing your notes before a presentation. We love the full-page view and you can see your slide on the left. Filling in company templates / updating text. You can easily double-tab and add text throughout your presentation. We don’t usually like to use templates, but on the iPad it does allow you to quickly knock out a presentation with key content that you can tweak and beautify later. Showing people your presentations. The iPad is the perfect size for showing people your decks, or as a support for a projected presentation…much faster than firing up your laptop. Not to mention that the Slide Show View is incredibly elegant & intuitive. Mocking up draft slides. Just because you don’t have all the precision tools of your desktop doesn’t mean you can’t throw down some content and begin to piece together a basic rough draft. The fact that it syncs to your OneDrive and directly back to your desktop means that you’re a few steps ahead of the game! So what does this all mean? It means that you should mostly be using PowerPoint for iPad as a tool for making quick edits to pre-existing decks or quickly tapping out a new ideas in thick strokes…which is where PowerPoint for iPad truly excels (and definitely outdoes its competitor apps)! Learn more about the ins & outs of using the PowerPoint app on your iPad with our free comprehensive how-to manual – “PowerPoint for iPad: A Visual Guide”. Again we’re SUPER excited to finally have PowerPoint on the iPad, and we look forward to more great updates to the app in the near future. The one thing we would love to see added in a future release, is the capability for some kind of multi-touch shortcut! Like, for example, moving things in a perfect horizontal alignment by (we’re just throwing this out there) selecting your object with one hand…touching another part of the screen with the other, and dragging the object. How cool would that be!